It was a bit of a race to get this quilt finished, as I wanted to include some beautiful fall leaves in my finished quilt photos. I’m pleased to say I won – while most leaves in our area had already fallen, I managed to find a little section of woods that still had some nice foliage! 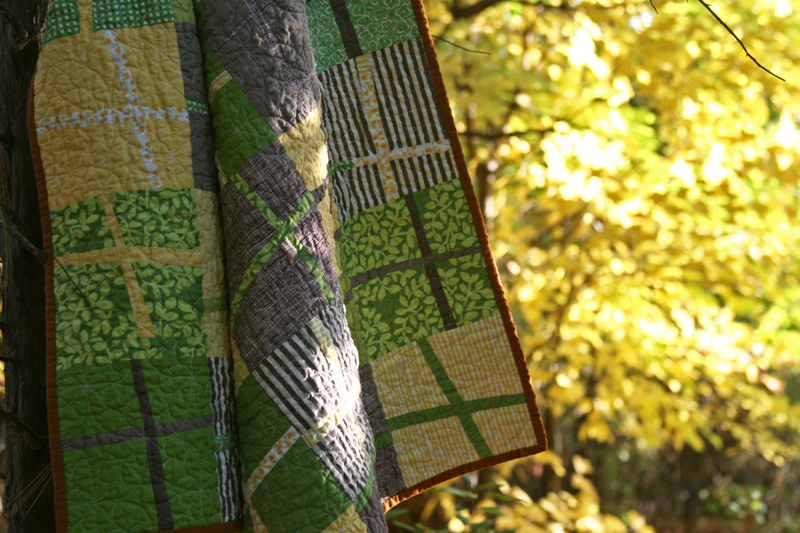 This quilt was made out of the stack of fabrics I pulled here, and as I said before, while that stack originally read spring-like to me, once I made it up into this quilt it really ended up having a nice fall feel to it. To add to that fall feel, I decided to quilt this leaf pattern, which is a little twist on Elizabeth’s Dogwood quilting pattern – a definite favorite of mine (yes, I may have mentioned that a time or two!). Anyway, I love the way she uses a grid for the quilting and started thinking about how I could use the grid to come up with a pattern to quilt leaves with a continuous quilting line. I did several drawings before I came up with this one, and I’m so pleased with it. 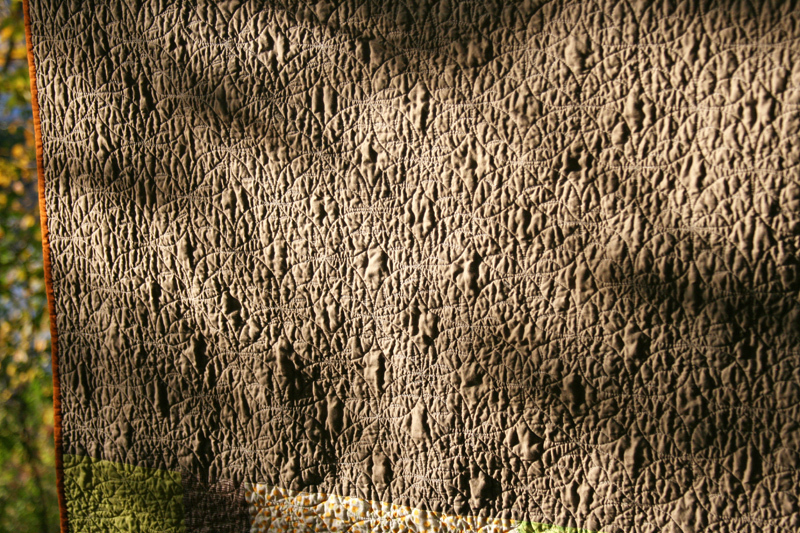 I intended to draw out an example of how I quilted it, but didn’t get it done in time for this post. So perhaps you’ll see that as an upcoming post! I guess I failed to get a full shot of the backing, but it’s mostly this brown/tan solid, with a pieced strip along the middle. 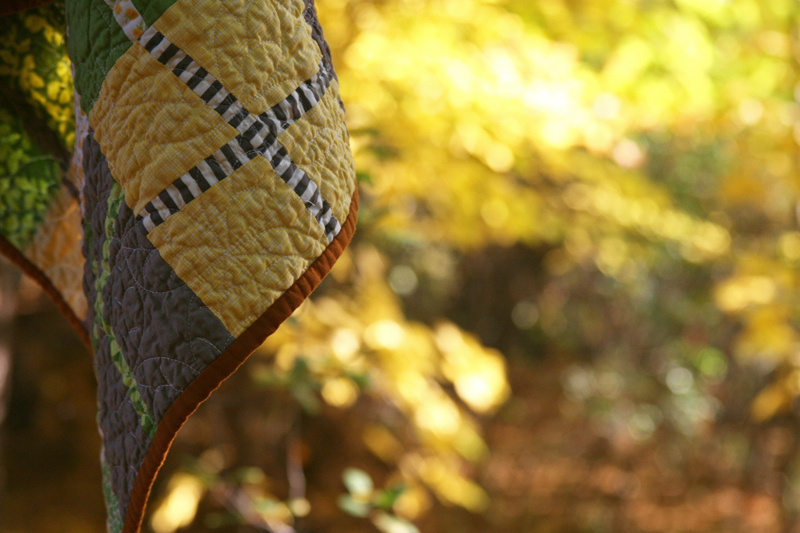 I love seeing all the quilting on the mostly solid backing, and I hope you can get a sense of that, despite the late afternoon autumn lighting in the photo above. I debated a bit on the binding – the obvious choice would have been one of the solids I used on the front, but I wanted the binding to stand out, so auditioned a few different solids, including a few shades of pink/purple. One almost got my vote, but in the end I felt this gold color (cotton couture cinnamon) really added an extra shot of a fall color to this quilt. This entry was posted in [search] Wonky/Improv Quilts, Posts about Quilts, Quilts and tagged cross quilt, fall quilt, handmade, improv, quilt, wonky crosses. Bookmark the permalink. That’s really pretty! I love that quilting design, too and I love the addition you made to it! Love your latest quilt! Please show us how you quilt it. The quilting is so beautiful. I want to learn this process. Thanks for sharing. Your palette is really lovely & perfection choice in the binding accent! so, so gorgeous! And the quilting is simply amazing!!!! This is very nice – it looks like you through and through. 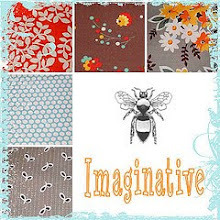 Great choices throughout, and I loved hearing how you made them. Thank you! I love everything about this quilt. You do great work and I love how you just decide and do it. I need your confidence! Thanks Ashley. Ashley, I love the colors here, you’re right very fall! 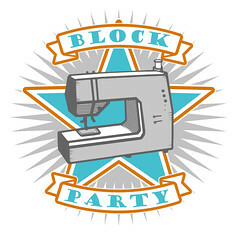 And that quilting design looks great! I love this quilt. I might even be inspired to try one on my own. I love your variation on the quilting too. It’s perfect. I think the solid colors on the back are so perfect for this! I love how you’ve show off the quilting. Beautiful! Oh I love this. It’s the perfect fall-coloured quilt! That is really beautiful. A gorgeous and really autumnal pallette and the quilting is especially lovely, what a great twist on the dogwood-must have been really time consuming! 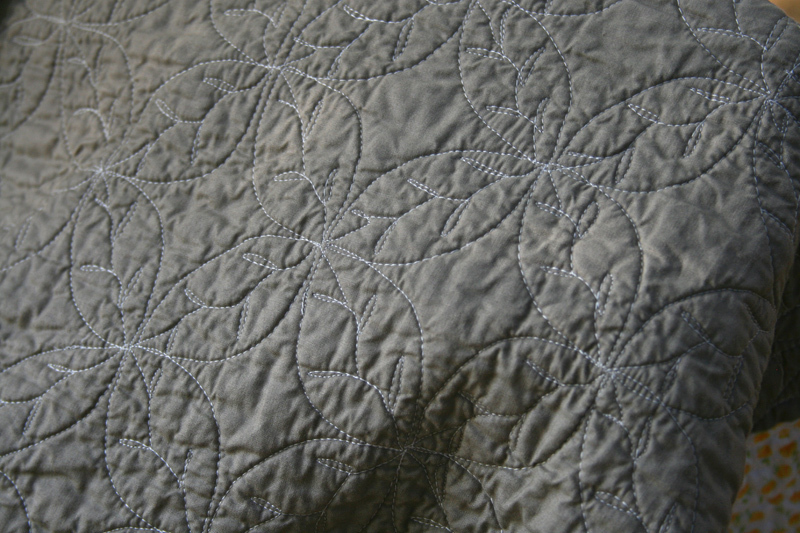 Also must say it seems there are an awful lot of quilted and bound finished quilts appearing on your blog these days! Impressive! I’d appreciate a sample or tutorial as I like the quilting a lot. Such a nice idea! I loved this quilt before, but not that it is quilted, I love it even more! Great design. I would be interested in you sharing your notes on it. not only are your quilts beautiful but your photo shoots are stunning. What a wonderful series of photos! 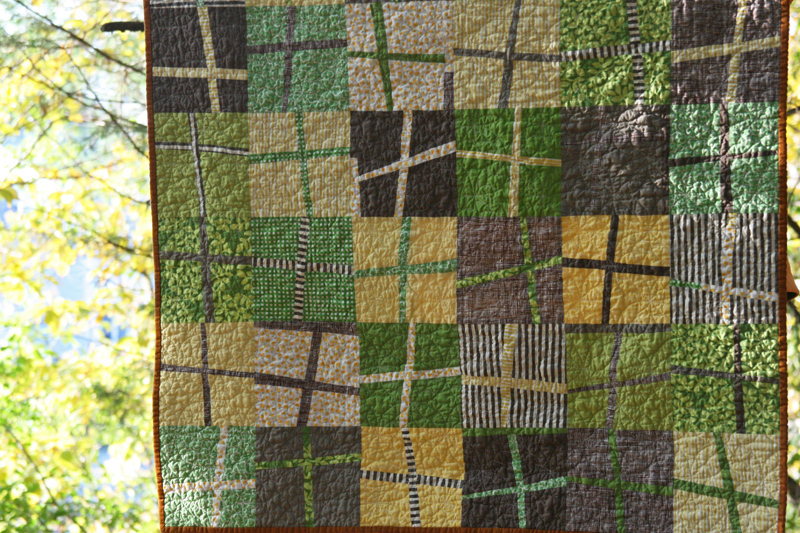 The quilting texture is fabulous…esp. against the bark of the tree with autumn leaves in the background….I am in awe of your productivity and generous, inspirational sharing….Thank you so much. Beautiful quilt! Love how it turned out! This is beautiful Ashley! 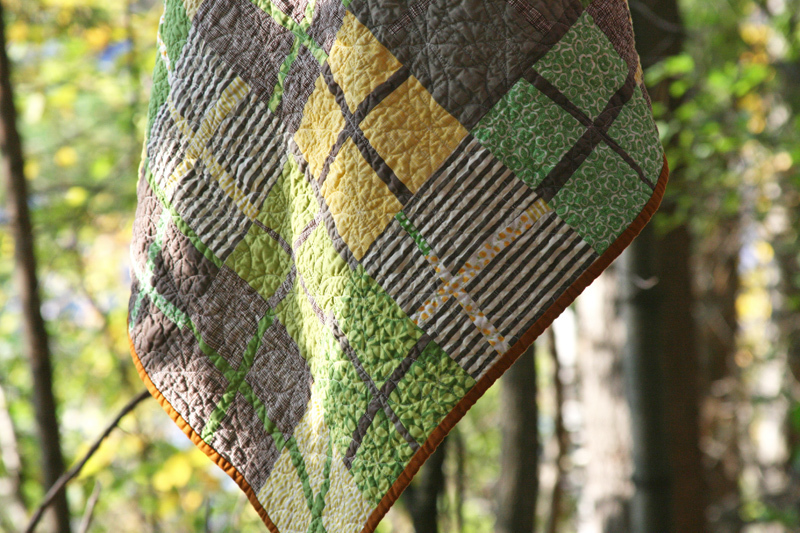 I love the colors and love the quilting! Love the colors! In fact, the combo is one of the paleets on Design Seeds today (11/1/12). Love the colors! In fact, the combo is one of the pallets on Design Seeds today (11/1/12). awesome twist on the orange peel quilting! Well I never tried quilting before but I heard that this work needs a lot of patience to produce quality output like this one.